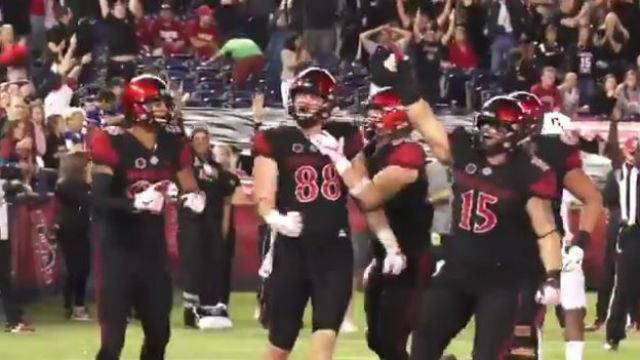 San Diego State University beat nationally ranked Stanford University 20-17 on Saturday night with just 54 seconds remaining on the clock. Quarterback Christian Chapman, a junior from Carlsbad, connected with tight end David Wells on an 8-yard touchdown pass for the come-from-behind victory in front of 43,000 fans at the former Qualcomm Stadium. “We beat a top-20 team. It was at home…You know what, going to keep getting better from here,” said Wells, a senior from Clovis, after the game. It was the Aztecs’ first win over a nationally ranked opponent at home since a 27-25 triumph over No. 23 Air Force in 2010. Head Coach Rocky Long and the SDSU team is now looking to the first game in its own conference, against Air Force next Saturday in Colorado Springs.